If you think having kids turns you into a old bore with the same routine day in, day out then maybe it’s time to shake things up! 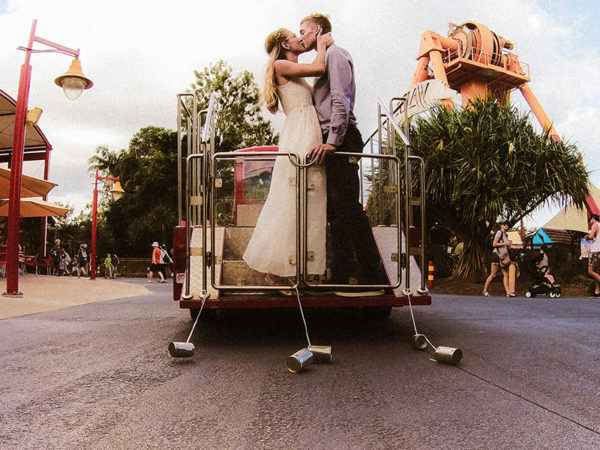 This young couple is not letting their toddler get in the way of their fun and just pulled off a cheeky vow renewal on a rollercoaster at Dreamworld to prove it. Grace and Eric Koelma know a thing or two about spontaneity. With a thirst for adventure and a slower pace of living, in March 2017 they packed up their lives and their two year-old son Leo, to go travelling while working along the way. Their Dare List Family blog chronicles their nomadic lifestyle with the couple keeping things interesting by undertaking various exciting dares, either set themselves or by others, on a regular basis among their travels and work. And their most recent dare issued by fellow blogger, daddyblogger, was probably one of their most interesting (and romantic!) ones yet. Many parents with young kids find it really hard to fit in time for date nights or special time together, but perhaps we should all be taking notes from Grace and Eric and think outside the box? With a bit of planning nothing is impossible. “Being parents of a toddler means we do a lot of pretty tame, kid-friendly activities and don’t get much time away as a couple to do the kinds of things we loved before we had kids. We know the toddler stage is fleeting and we love hanging out with our son, but it’s important to keep the thrill of romance alive as well,” Grace adds. So hands up all of you couples with little ones, who’s game?! Don’t mind if I dooooooooooooooooo! What fun dates have you and your partner managed to pull off? Tell us on Facebook!